One sure way to increase your restaurants profit margin is to increase sales. The first rule of economics is sell more, earn more. Increasing sales will increase your restaurants profit margin, but by what degree may surprise you. To translate sales numbers to profit, restaurateurs must deduct several costs from their total sales before having an accurate calculation of their profit margin. Owners must account for the cost of the goods, the cost of labor to facilitate sales, and any taxes that may be due to local or federal governments. On average, restaurants spend 50%-75% of their total sales on food and labor. However, restaurants operate between 1%-15% profit margin, with most falling between 3%-5%. 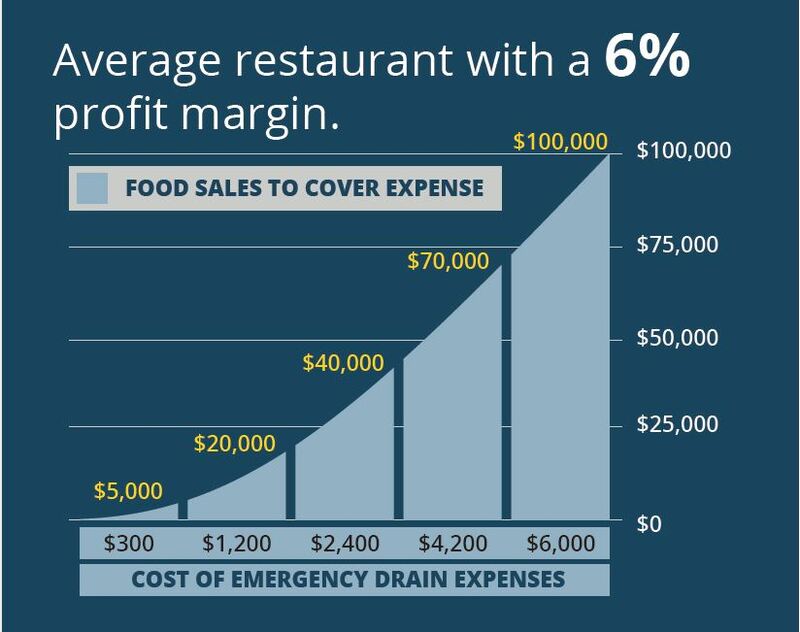 In order to see a significant rise in profits from sales alone, food sales must increase exponentially to cover emergency and unforeseen expenses. Preventive maintenance can greatly reduce or completely eliminate expenses. Protecting all kitchen drains is the easiest way to eliminate emergency drain maintenance calls, and greatly reduce your overall plumbing expenses. Protecting your floor sinks and mop sinks with PermaDrain’s Locking Dome Strainer will prevent utensils, dishware, gloves, bar towels, and other debris from clogging your plumbing system. It is also imperative to ensure all of your floor drains are protected by a securely locked down strainer grate cover. Floor drain covers are often removed when cleaning, leaving them susceptible to large amounts of kitchen floor debris. Using PermaDrain’s 3 ½” Cross Strainer will provide 3 anchor points to securely lock down your drain grates with high security, tamper proof screws. Solid food waste and foreign debris can also enter your grease trap through 3 compartment and prep sink drains. PermaDrain’s DrainShield will prevent solid debris from entering grease traps, as well as extend the life of any existing slide, twist, or lever waste drain. At the end of a day, running an efficient business will increase your profit margin more quickly, and more consistently, than simply improving sales. Securely protecting your kitchen drains is one of the easiest and least expensive measure you can take to increase efficiency and increase your profit margin. This entry was posted in Drain Protection, Tips and tagged Cross Strainer, Expenses, Locking Dome Strainer, PermaDrain, Profit, Sales.